Hey guys, I just recently bought a Osborne 1 laptop (well, its more of a lunchbox xD), and I would like to stuff Windows 1.00 on it, but I dont think this laptop has an hdd in it. I found a 5 1/4" floppy drive (what the Osborne uses), and I need to know what kind of connector this is. 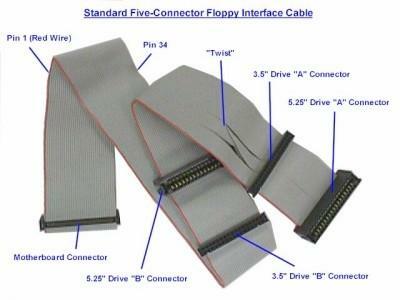 It's just a 5.25" floppy connector. Good luck finding a cable though. The big one at the right of the picture. Well, they are common, some times you can buy them still in stores, othertimes search ebay for such cable, otherwise buy an old computer (like 486, Pentium 1) they have such ones. So thats what that connector is for the problem is the cable I have with it I can't find it either as I know I had a bunch of IDE cables. I found it in a computer box I got free a while ago, and the drive was just in there, so maybe there is a cable in there. Well if there isn't then everyone I know is gonna say im stupid for buying an old pc lol. If the BIOS supports 3.5" drives why don't you juse use one of those and copy the floppies you have on to 3.5" disks? But I guess you would need a 5-1/4" drive setup to copy them. Have you looked online for disk images of what you're trying to install? 3.5" disks are either 700 something KB or 1.44MB, 5-1/4" disks are only like 1.2MB. So you should be able to write 5-1/4" disk images on to 3.5" disks. I would use 3.5", but I don't think I can just shove any old floppy drive into the Osborne. Also, this is just for collecting purposes, Im not going to use this everyday for something lol. Also available is the Double-Density Disk Drive Option. This is an additional circuit board which must be installed inside the system. Doubles the amount of data storage per diskette. Good luck finding disks to work in those drives, unless you already have some. Out of curiousity, do you happen to have any of the software that originally came with the machine? Last edited by QuiescentWonder on Wed Jul 15, 2009 8:43 pm, edited 1 time in total. Yeah, i know. I'm hoping the one I bought will come with copmatible disks already.